Primal Fear has made a name for themselves by sounding hauntingly like the great Judas Priest. Black Sun continues where last year's Nuclear Fire album left off. The Rob Halford-style vocals over power chords galore, finely crafted solos, and enough head-banging candy to rot your neck. In this day and age someone has to do Judas Priest well, why not Primal Fear? It's a tough call to say which band does it better but my vote is for Primal Fear. Have you listened to the new Priest album since it came out? I haven't. A cool introduction called “Countdown to Insanity” starts this thing off and is followed by the title track, “Black Sun.” The beginning of this track sounds so much like “Painkiller” that I have to sing, "Faster than a bullet, terrifying scream" every time I hear it, but then it goes in a different direction than the Priest song does. This is actually my only complaint about an otherwise perfect album; I feel the first track needed to be just a bit ballsier. The next one is “Armageddon,” and it contains another great riff and a chorus so huge that you'll be singing along to in no time. Most of the songs on Black Sun use this formula: a great hook with a mid-tempo beat, a massive chorus followed by some fancy guitar work, complete with dueling solos. A few tunes are a bit faster like “Light Years From Home” and “Mind Machine,” but they, too, have great riffs. A major high point is the great build-up on “Revolution,” one that is sure to launch the fists in the air and has anthem written all over it. “Fear” is also a killer track and would have fit perfectly as the albums opener. Most songs come in at around three and a half minutes including the closer, “Controlled,” which finishes with the same theme that opened the album, a great way to top this thing off. 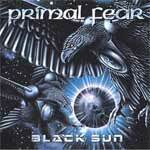 Black Sun is another impressive slab of old-school metal from Primal Fear. Definitely one that will fuel the blazing fire of Priest comparisons this band has garnered since it released Nuclear Fire last year. But once again, Painkiller-era Judas Priest is a fine time indeed to adopt as a style for your band. Nobody here is complaining, save for a few die-hard Priest fans I suppose, but too bad for them, Primal Fear know how to do it, in the present.